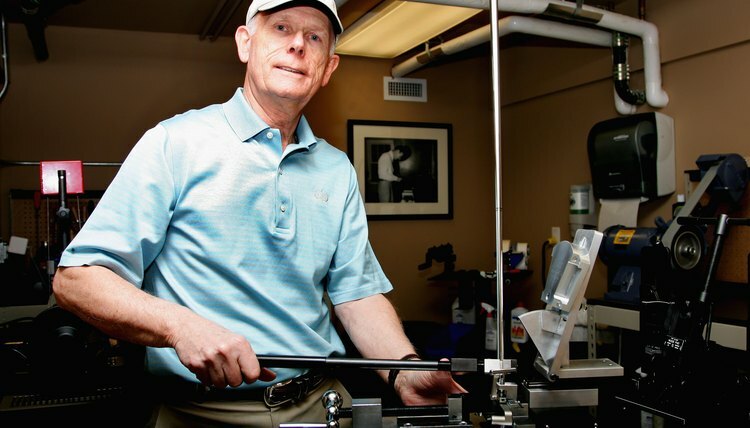 Having the right tools and knowledge of your golf equipment may give you the edge you'll need on the links. Golf club shafts come in a variety of thicknesses to accommodate players of different sizes, strength and ability level. The hole in the base of the club head, or hosel, must be the same size as the shaft or it will not fit properly. A shaft that is too small for the club head can be dangerous because there are gaps between the inside of the hosel and the surface of the shaft that prevent the glue from creating a solid seal. The club head may wobble at the point of impact or even slide off the end of the shaft during the golfer's swing. Clean off the tip of the shaft with a damp rag. If there is dirt, glue or other debris stuck on the shaft, scrape it off with coarse-grain sandpaper. Insert the end of the shaft into the club head's hosel. Push the shaft down as far as it will go without forcing it. Use a felt-tip pen or a piece of masking tape to mark the point where the shaft enters the hosel. Remove the shaft from the club head. Start at the mark you made in the previous step and sand off the coating of the shaft from that point down. Use a utility knife to scrape off the coating if you are working with a graphite club shaft. Place the tip of the shaft into each slot of a shaft tip identification gauge until it fits perfectly. Read the label next to that slot to find the width of the tip.